Our full list of events for IAW 2014 is out! You can click the schedule to download it in PDF. A leaflet of the events is also available for download here. 9 Brands to Boycott – Hold Israel Accountable! http://electronicintifada.net/content/internal-documents-show-canadian-tax-agency-protected-jewish-national-fund-scrutiny/12393 Will Canada tolerate illegal activities abroad by Jewish National Fund? WINNIPEG—The Winnipeg Coalition Against Israeli Apartheid is appalled by the University of Manitoba Students’ Union’s April 11 decision to end Students Against Israeli Apartheid’s student group status and ban it from operating in students’ union space. The motion passed by UMSU Council equates criticism of the Israeli government to discrimination and harassment, and takes extraordinary measures against a student group, although it appears no evidence was presented to substantiate the accusations. Israeli Apartheid Week, a global event dedicated to education and debate on Israel’s military occupation of Palestine, has been running on Winnipeg campuses and in the community for 5 years, and SAIA groups have repeatedly shown they are seeking dialogue, while opposing racism and other human rights abuses. There were no incidents of harassment or discrimination by event organizers, speakers or participants at IAW 2013. WCAIA maintains that SAIA’s work embodies respectful and fair political comment, and believes that the UMSU motion constitutes slander, and repression of free speech and freedom of association. WCAIA is pursuing a legal opinion on the matter. Des portes-paroles francophones sont disponibles. Winnipeg—On March 30, Palestinian Land Day, several Winnipeg groups that joined together to protest a new product at The Bay are marking the occasion with the last of their 8-week info-picketing sessions. The groups, united as the Winnipeg Coalition Against Israeli Apartheid, focussed their efforts on the SodaStream home carbonation system because it is manufactured in Mishor Adumim, an illegally-established Israeli industrial area, part of the illegal Ma’aleh Adumim settlement. The settlement was built on land that used to be the Palestinian towns of Abu Dis, Azarya, A-Tur, Issauya, Han El Akhmar, Anata and Nebbi Mussa. 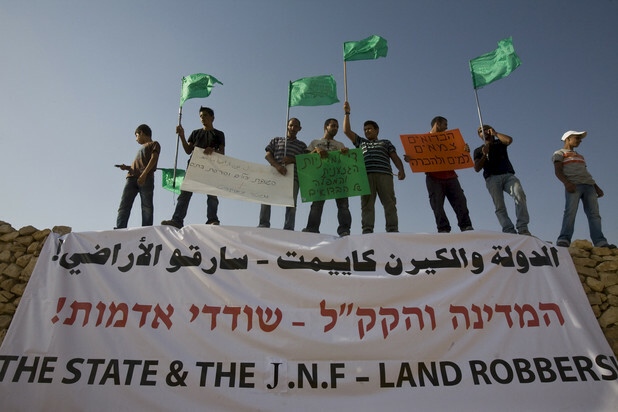 The groups organizing the initiative point out that the Fourth Geneva Convention, which Israel signed, prohibits colonization of any occupied territory. As one of the largest settlements in the occupied West Bank, the scale and location of Ma’aleh Adumim make it an obstacle to peace. As it concludes the 8-week information picket, the Winnipeg Coalition Against Israeli Apartheid (WCAIA) vows to continuing putting pressure on retailers to stop selling SodaStream. WCAIA notes that several large retailers now carry SodaStream, including The Bay, Canadian Tire, London Drugs, Sears, and Wal-Mart. email info@wcaia.ca to arrange an interview or request more information. SodaStream Picket continues today – 12-1pm at The Bay Downtown Winnipeg. Join us! Continue reading SodaStream Picket continues today – 12-1pm at The Bay Downtown Winnipeg. Join us! Thanks to everyone who supported Israeli Apartheid Week WInnipeg 2013! 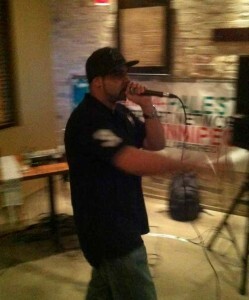 Thanks to Lyrical Militant and Cousins for making the wrap-up event special! 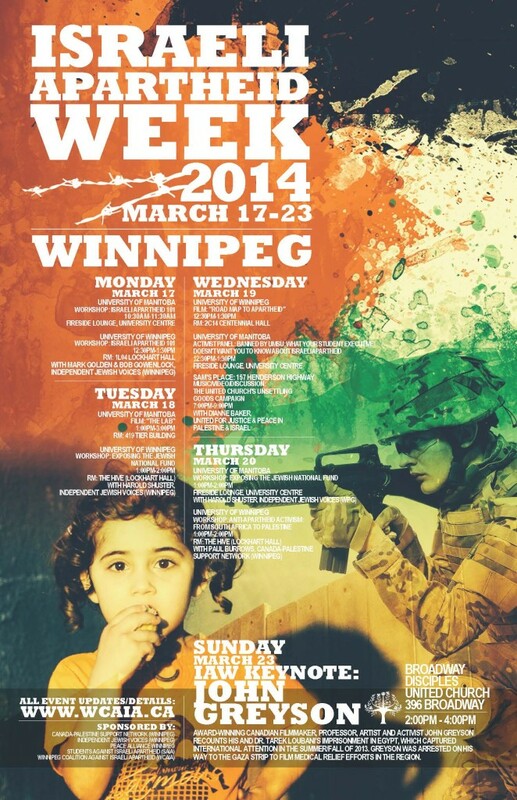 Continue reading Thanks to everyone who supported Israeli Apartheid Week WInnipeg 2013!